Mitsubishi Motor Philippines Corporation (MMPC) is the latest carmaker to announce its new suggested retail price or SRP taking into account the Tax Reform for Acceleration and Inclusion or TRAIN Law. Like Toyota, Mitsubishi’s announcement serves as a barometer of sorts since they carry a wide range of products from sub-compact hatchbacks to luxury SUVs. 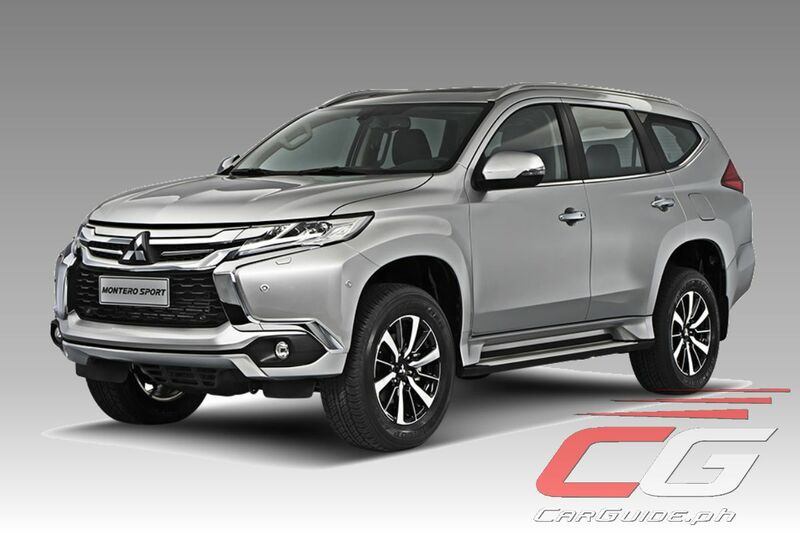 As expected, Mitsubishi’s prices are up across the whole model range with the exception of the Pajero which remains steady at P 2,770,000. That said, the price increase is actually managed well with a vast majority of products gaining just 2 to 5 percent in price. 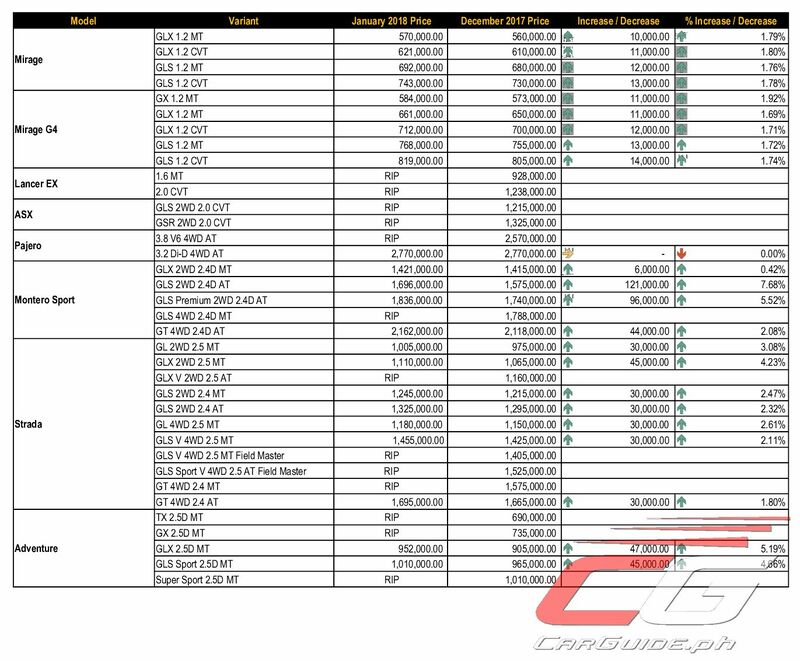 Biggest hit is actually the Montero Sport, in particular the mid-range GLS and GLS Premium variants which see a 7.6 percent and 5.52 percent increase respectively. Even more interesting is MMPC’s decision to increase the Strada’s pricing this January. Supposedly exempt from excise tax, MMPC cites unfavorable exchange rates during the latter part of 2017 for the increase in price. Furthermore, these Strada pickup trucks are all 2017 stocks and are therefore covered by the previous excise tax scheme. MMPC expects to deplete their stocks in the next few months, and only then will they announce the effective post-TRAIN price. Also, worth noting is Mitsubishi’s thin line-up for January with several models and variants absent. 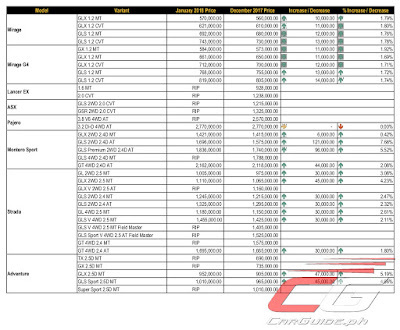 Notably missing from their official price list is the Lancer EX and ASX as well as certain variants of the Montero Sport and Strada. The Adventure too sees a reduction of variants from 5 to 2, but this is likely due to their impending phase out due to not meeting Euro 4 emissions standards. Comparing Mitsubishi’s official January prices versus our predictions last December, we’re spot on: just 0.96 percent off with the Montero Sport GLS Premium and 0.18 percent off with the Mirage GLS CVT. This continues our accurate prediction streak to 5 out of 5. Seems they haven't published the price updates on their website yet. End the suspense and let us know please? Sorry, the table is now up. It didn't load the first time. Not too bad on the Mirage lineups. Lancer's demise parang long time coming na. Surprising yung sa ASX though. Feeling ko stocks lang yan. It might come back at a later time. Why strada pick up increase its price???? ?based on tRAIN pick up is exempted??? Bat may adventure pa? Db bawal na Euro 2 sa 2018???? They can still sell the Adventure kasi existing stocks na lang, they can't make any more of it though. Nice one mitsubishi! Nag decrease nga toyota ng 100+k sa pickup at mag increase pa kayo? Who would buy a 2017 Mitsubishi strada pick up now with the increase price when they can just wait and a 2018 Mitsubishi Strada pick up could eventually be cheaper under the new tax scheme? Bakit my adventure pa?db euro 2 engine 4d56? Sa law all engine must be sold 2018 dapat euro 4 na? anong nangyari? bat ganun? Yung ISUZU dito sa mindanao naga display pa ng crosswind? May remaining stocks pa kasi sila. Pero tumigil na yung production ng Adventure at L300. Sayang lang hindi nag sagawa ng final assembly ng Adventure at L300. Tsk tsk!